It's time to show-off your baking talents! We do hope that many of you will join our Baking Contest andmake delicious desserts for our annual 4th of July picnic. Step 1: Pick a recipe. Pie, tart, cake...we won't be difficult to please! Step 2 : Choose an original name. In years passed, we ate a "Teeth-breaker Tart", a "Cerise Polka-dot Pie", and a "Chocolate Ugly Duckling Pie"! So be creative! Step 3: Sign up by sending an email to Philippe at: philippe.morard33@orange.fr . All guests (members & non-members) attending the Picnic are welcome to participate! Go here to sign up for the picnic: http://picnic.bordeaux-usa.com . Step 4: The day before the picnic (June 24th) prepare your gastronomic delight. Step 5: Please bring it the day of the picnic (June 25th) around 11:00 am so that we've got time to store them and be ready to display them later. 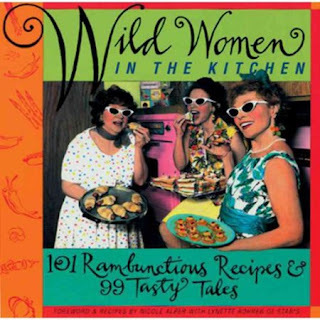 Step 6: The jury will taste each cake and the winner (maybe YOU) will get a prize: Wild Women in the Kitchen. A book about dynamic women (some of whom happen to like cooking) that includes a lot of tasty recipes & wild stories about said women! Contestants: Start Your Ovens! We look forward to enjoying your creations!